The owl went off at five o'clock. There was just enough light gathering above the eastern escarpment of Bonita Canyon for me to read my watch. Western Screech-Owl. Birders dialed in to the night shrouded world of owling typically do their thing from sundown to midnight, forgetting that owls are active just before sunup as well. I had to smile. Bears had been on our mind since the previous afternoon, and owls and bears always seem to go hand-in-hand (talon-in-claw would be the more apropos catchphrase I guess) in wild and isolated places. Two old men, locals from Safford, had rolled into the parking area at the Serna Cabin unit of the Gila Box Riparian National Conservation Area in an even older pickup replete with two dogs, many cans of soda, and a diminishing supply of cigarettes. They were the only human beings we were to see in our three-day sojourn in the Box. We listened to their stories and scratched their dogs' ears until they finished off the soda and smokes. Like all old rural locals across the planet, they were accomplished and fascinating raconteurs, and their best story under late afternoon monsoon skies crackling with dry lightning was about the time, recently they emphasized, they had encountered three bears "right there across the creek at the base of that wall." Apparently there had been a mama and two cubs shuffling off down canyon, but one of the dogs had gone after one of the cubs with, of course, the expected consequences. Mama bear came charging back, grabbed the canine offender by a hind leg (herewith the now-healed five inch slash on said victim's hind leg had been exhibited for our edification) and tossed it. The bear turned to walk away again but the dog, undeterred, ran after her. "That ole mama bear just sat down on her haunches right there and started waving her arms around. She was gonna play baseball with that dog." My companion on this trip, a real "bear person," was so excited about a possible evening (or nighttime) bear sighting he could scarcely eat dinner and get to sleep. But he wasn't at all sure it was the best idea to throw our sleeping bags on top of a picnic table instead of curling up inside the van. The night had passed without incident, bear or owl, and we were up at first light to hike up Bonita Creek looking for Common Black Hawks. Hearing the screech-owl added an extra dimension to the feel of wildness in this beautiful area hidden within the barren folds of these high desert tablelands. Along the top of the wall above this section of lower Bonita Creek where it flows into the Gila there are traces of old two-tracks. The Bureau of Land Management, in a stroke of inspiration, has paved a trail up one of these traces, perhaps 200 yards in length, leading to a ramada overlooking Bonita Canyon. A kiosk at the entrance to the Box touts the overlook as being at "treetop level." As not all things BLM are as touted, I was skeptical until I saw the ramada. It is at treetop level, and these trees are centuries old cottonwoods. Bonita Canyon is deep. The walls of the canyon are spectacular. A misstep along the edge would be a step into eternity. The first afternoon, upon arriving, we had walked up to the ramada, held our breath, and peered over. "Awesome" is overworked in our post-modern vocabulary, but there is no other word that describes this scene so well. This is a tiny but grand canyon. The walls are vertical, even undercut in some sections, the tops of all but the tallest cottonwoods are below the top of the walls, but Randy Johnson could throw a baseball from one wall across to the other. Here's how high the walls are: looking down from the ramada it appeared to us that hiking upcanyon skirting the occasional pools, the remnants of spring runoff, would be no problem. At creek level, however, the floor of the canyon was in fact a maze of cobble bars, some quite steep, narrow but deep arroyos sharply cut by past stream action, impenetrable blowdowns, and impassable piles of debris brought down by floods of monsoons and winters past, all this relief along the canyon floor hidden by the perspective of looking down from the rim high above. 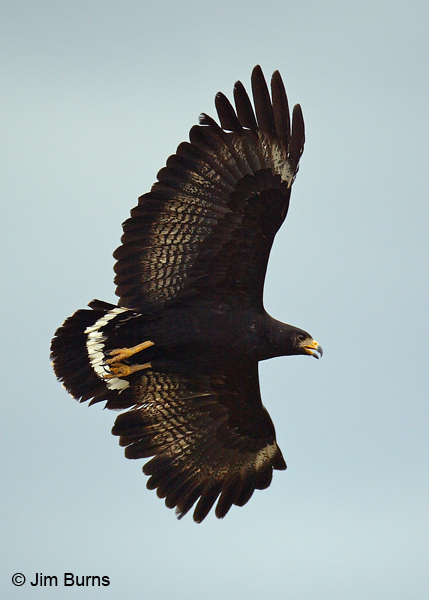 The motivation behind this trip is flight shots of Common Black Hawk. Over the years I've stumbled onto many good black hawk photo ops, all perched birds, but I wanted to get flight shots of this species comparable to some recent images I had taken of Zone-tailed Hawks in flight. The ultimate goal was to develop a photo quiz showing how tail pattern and length of the primaries make distinguishing these two all dark southwestern buteo specialties relatively easy. I had learned over the years the only way to get tack sharp flight shots is with the sun at your back, the birds close and at eye level. This third qualifier, at eye level, is the real key. Photos of raptors flying directly overhead are usually diagnostic and often appealing, but proper exposure against a blue or white sky is difficult, and typically in overhead situations the birds' heads comes out "fuzzy" rather than sharp. We were hoping that looking out over the tops of the cottonwoods would put black hawks in flight right at our level. But then again, with bird photography, the best laid plans rarely become reality. It's just so hard to reach these raptors' agents and get everything set up perfectly. No sooner had we peeked over the rim on the previous afternoon, than we had heard a black hawk screaming. Glassing from the bend in the canyon to the north down to the confluence with the Gila to the south produced no sightings, but black hawks are like that, rather unbuteo like buteos that still hunt from below the canopy for fish, frogs, and snakes. In retrospect I realized the only times I had seen Common Black Hawks soaring like real buteos are expected to soar was during migration or after some kind of nest disturbance. Returning on foot to the Serna Cabin picnic area for dinner, we discovered two adult black hawks perched directly across from our van. Never fails! When they saw us coming they both took off, one downstream for the Gila, the other upstream, both staying well below the canopy. Judging by its heavier build, the upstream bird was probably the female. Sure enough, just as the raconteurs drove up with soda, cigarettes, and dogs, we saw this adult, followed closely by a beautifully marked chocolate brown juvenile, flash out from a cottonwood bough and head still farther upstream. It is the following morning and we head upstream toward the owlsound. We can make no more than twenty yards before we are stopped by a huge tangle of branches along the left bank which precludes all progress. And the owl has long since become silent. We return to camp, ditch the tripod and large telephoto, grab a smaller hand holdable 400mm, pick our way carefully across the Bonita on partially submerged stones, and head up along the right bank. We make slow progress but neither see nor hear the hawks. Then, a quarter mile upcreek an adult flashes past us along the main channel near the left wall. We break into a clearing atop a sandbar and see the juvenile perched fifty yards ahead. The moment it sees us it flies off to the north. It is apparent that we could spend weeks down in this canyon without ever having a black hawk sit for us. We turn around and pick our way back down to our campsite. Our second afternoon is waning. We are back on top, along the rim wall. Off to the northeast is the tallest cumulous cloud either of us has ever seen. Like a lover in some dream fantasy, it is beautiful yet ominous. It looms over the entire horizon, dwarfing the golden mountain ranges from whence it seems to spring, gray on white, roiling, rolling slowly towards us, lightning flashing from it lowest, darkest contours, tendrils of rain already loosing the always welcome aroma of wet desert. This will be a male rain. We linger, knowing from the far off sound of thunder we have enough time to make it to the van unscathed. Then, inexplicably, from the cottonwoods below, a black hawk screams. We turn to see the male (Surely it is the male. We have seen the female accompany the juvenile upstream.) rising up the wall across from us, circling, gaining altitude, his ever widening loops bringing him close and closer. The fringes of the huge cloud have not yet reached the westering sun behind us. The autofocus acquires a crisp image quickly and follows cleanly. I depress the shutter button, hold it down until the buffer is full, count fourteen alligators, then hold it down again. Now the hawk is right above us, still screaming. A Canyon Wren cascades down the rubble of the sheer wall, following its descending song. A Cassin's Kingbird on high alert launches toward the hawk from the closest cottonwood. The streak of red along the hillside above us becomes a male Summer Tanager as it intersects the top of a mesquite. Somewhere on that hillside a shrike protests the coming storm. My friend has been glassing the trees below while I shoot the hawk. He nudges me excitedly and points. Directly out from our promontory near the top of that closest cottonwood is a hawk's nest. Empty now. This year's nest? There is one sprig of still green branch hanging from the accumulated detritus of the nests of years past. Perhaps we, and not the storm, have triggered the male's defensive instincts by inadvertently appearing so close to this year's nest? Suddenly we realize the cloud has outdistanced us. It has enveloped the sun. We feel the first drops. The big drops of a male rain which splatter and seem to sizzle on the rocks around us. We race to the van. We tumble into the open side door, shrieking in exhilaration. Next May, before the monsoon. We etch it into our mental calendar. And my friend avows he will bring his own camera. He wants bear photos.